Whatever other qualities Paul Azinger has exhibited as a past — and future? — United States Ryder Cup captain, no one can say he doesn’t have a consistent message. When I saw his quotes in stories by Steve DiMeglio of USA Today and Alan Shipnuck of golf.com in the wake of Europe’s resounding defeat of the U.S. Sunday in the 40th Ryder Cup at Gleneagles, Scotland, his comments sounded familiar. Well, the Americans have lost three consecutive — and eight of the last 10 — Ryder Cups and the “controllables” are on a lot of folks’ minds as the latest U.S. loss gets dissected with the eagerness of a high school biology class with a new shipment of frogs and tweezers. No doubt captains can and do count in the Ryder Cup. Maybe it’s the 1 percent that Azinger — whose winning “pod” and “like personalities” approach at Valhalla in 2008 that was part of the first U.S. win since 1999 wasn’t utilized by the three successive U.S. captains — talks about. Maybe it’s even more than that. Certainly many of the Gleneagles post-mortems are centering on U.S. captain Tom Watson and what he did or didn’t do two decades after guiding America to a Ryder Cup win in 1993. The man whose golf game has been so uniquely full of life so often in his 50s and 60s didn’t have the same verve as a 65-year-old skipper of a team missing several top American players. PGA of America president Ted Bishop went old-school in selecting Watson, and the pencils and chalk broke. A country, once again, was no match for a continent. I don’t think the Ryder Cup means more to Europe than the U.S., but it means something slightly different. That was evident again at Gleneagles, as it had been at Medinah, Celtic Manor, the K Club, Oakland Hills, The Belfry, Valderrama and Oak Hill — all the places there have been happy day-after headaches for the “Ode to Joy” gang starting in 1995. There may be an X factor that has no explanation. That was never more true than on the second day of the matches last week when Ian Poulter, clearly struggling in contrast to his superhuman last several Ryder Cups, had a pivotal and unlikely pitch-in that meant so much for his side. So what should the Americans do so that their clothes, not those of the their European counterparts, might be stinking of champagne on a Sunday night in September? Tony Jacklin, who led Europe’s resurgence as its captain in the 1980s, told me in 2010 that Azinger was the only subsequent captain who had picked his brain about the Ryder Cup success. Jacklin had no deep secrets — he made sure everything was first class, oozed confidence and tried to be a true friend to his charges during the matches — but that Azinger sought his wisdom says a lot. Azinger’s team-building methods, broadly if not specifically, should be considered in 2016 and beyond. It would be a radical change, but give the captain the opportunity to select his entire team, not just a couple of players. Azinger had increased the number of U.S. picks to four so that the squad might suit his ideal, but Watson — somewhat surprisingly, given his forthright approach to playing the game — reduced it to three. Regardless of the specific evolution of the American captaincy or team between now and Hazeltine National in 2016, the status quo doesn’t seem to be an option. What happened in Scotland did not stay there. The man (or, why not, woman?) calling the shots and the men hitting them need to do different, and better. With rare exception, for a long time now, the percentages, whatever they are, aren’t adding up to a hundred for the U.S.
Phil Mickelson wasn’t going to win the BMW Championship before he bailed on the final two rounds at Cherry Hills, but his exit formalized what, thanks to injury and ugly golf — or both — has been in view for weeks. With Mickelson’s early exit from Colorado, although it probably won’t be a priority for spectators disappointed not to see him this weekend, an era is officially over. Each season from 1993 through 2013, either Mickelson or Tiger Woods — or both — won a PGA Tour event. That is 21 years, a generation, a lot of success for the two men who have defined this span of golf that began in one century and continued into another. Seventy-nine wins for Woods in the period, 41 for Mickelson (whose other tour win, as an amateur at the 1991 Northern Telecom Open, predates it). A total of 120 victories that are the statistical lumber of their roles over two decades that have been dominating, captivating, mystifying, aggravating — sometimes all at once. Without a victory by either golfer in the hyphenated 2013-14 PGA Tour season, during which the two stars were primarily frustrated by their ineffectiveness, the streak is over. It says Mickelson is 44 and Woods is 38 and that nothing is forever. It says they have been superb and tenacious golfers and we have been fortunate to watch them go, styles as different as right and left, disparate except for their appetite to be clutching silver or crystal after 72 holes. Their tango at the top — Woods leading — compares favorably to previous duos who have won tournaments over long stretches. Over the past century four other winning pairs who were part of such enduringly successful streaks come to mind, every one of the golfers a legend. As Snead and Hogan were winding down, the two other eras were beginning. When Mickey Wright won the 1956 Jacksonville Open, that started 23 consecutive years of winning on the LPGA Tour by she or Kathy Whitworth that concluded with Whitworth’s victory at the 1978 National Jewish Hospital Open. Whitworth would win a record 88 titles, Wright 82. Arnold Palmer and Jack Nicklaus did the women one better on the PGA Tour, a 24-year stretch that started with Palmer’s 1955 Canadian Open triumph and ended with Nicklaus’ 1978 IVB-Philadelphia Classic title. Palmer (1955-71), Nicklaus (1962-78) and Whitworth (1962-78) have the longest individual streaks on the PGA Tour and LPGA Tour with at least one victory a year, 17. Those records figure to last a long time as surely will Gary Player’s 28 consecutive years (1955-82) of winning a tournament somewhere around the globe. We’ll see in a few months whether Woods and Mickelson have the stuff to resume winning, to start a new streak to follow the old one, which began with Mickelson’s victory at the 1993 Buick Invitational of California and ended when Woods won the 2013 WGC-Bridgestone Invitational. It won’t be easy for either of them, at or loitering at the top for so long. Golf years are not quite dog years. The very best keep their bark before we notice, or sometimes accept, their bite is gone. But with both Woods and Mickelson being shut out this season, age cannot be ignored. Win or lose, as for a generation, many will be watching. No doubt the best birthday present for Tom Watson, who turns 65 today, would be a belated one: a Ryder Cup victory later this month by his United States team, which hasn’t won in Europe since 1993, his previous turn as American captain. Watson announced his three captain’s selections Tuesday evening and unveiled the team uniforms Wednesday morning — both on television, which scarcely had an interest in golf when anyone outside of Kansas City first heard of Tom Watson more than four decades ago. The picks were scrutinized more than the threads, or at least one of them: Webb Simpson, the 2012 U.S. Open champion who was all but absent in the major championships this season. Chris Kirk’s Deutsche Bank victory was too little and too late for a captain who already had three Ryder Cup rookies on his team along with the singular Bubba Watson, a Simpson pal and partner at the 2012 Ryder Cup. In the long view of Watson, the fabric of his squad or its clothing will mean about as much as a practice round in January to a golfer’s chances at the Masters in April. The fact that Watson is still a public golf figure, not someone merely hitting balls on the back forty of his farm as he becomes eligible for Medicare, encourages an appraisal of how he got there. Despite eight major titles among his 39 PGA Tour victories, Watson isn’t in the conversation as best golfer ever. Thanks to his grit and extraordinary competitive longevity, though, he loiters in the frog hair with the right to be justifiably proud that he was the best of his time, a juncture when he took the baton from Jack Nicklaus like a sprinter hungry to win a high-stakes race against the fastest man in town. When Watson turned back Nicklaus in 1977, first in the Masters then a few months later in their epic showdown in the British Open at Turnberry, he defeated a longtime star still fit, focused and in no mood to be dislodged from his long reign atop the sport. With his improbable chip-in on No. 17 in the final round at Pebble Beach in 1982, a delicate shot that delivered an forceful upper-cut of disappointment to Nicklaus, who could taste his record fifth U.S. Open, Watson reiterated what he was all about. And he led the PGA Tour money list five times when the feat was still a true currency of achievement. The clutch golf Watson played against the game’s 20th century standard of excellence to make his name will still be recalled some far-off date from now as among the finest ever. One fringe benefit of his role as U.S. Ryder Cup captain is that younger people will get a tangential reminder that the Midwesterner with the deep creases on his face and a walkie-talkie in his hand was as tough as they come when facing a shot or putt that really mattered. More than his mere excellence, for my generation — I’m 55 — Watson is the great golfer that we have gotten to see with our own eyes from pre-prime struggles to peak performances to post-prime amazements led by his runner-up finish at the 2009 British Open at age 59. As intently as I’ve tried to study Nicklaus, I was only 3 when he won his first U.S. Open, 6 when he won the 1965 Masters in awesome fashion, 11 when he sailed his putter toward the sky upon winning his second British Open, at St. Andrews in 1970. Nearly 20 years my elder, Nicklaus could have been my uncle, or even my father. Watson was like a silly-talented, super-dedicated, high-achieving big brother who hated failure and learned from it in equal measure, a rare and potent attribute for an athlete striving to succeed. Nobody likes losing, but not everybody can build something from the hurt as Watson did after early major blow-ups such as shooting a final-round 79 with the lead in the 1974 U.S. Open at Winged Foot. Byron Nelson offered help and Watson accepted, the mentoring by one of the very best helping Watson to his first British Open victory the following summer at Carnoustie. Not long after Watson’s disappointment at Winged Foot, I was a standard bearer for his grouping in the 1974 World Open at Pinehurst No. 2. For a 15-year-old totally hooked on golf, 18 holes with Watson was quite an education. There were detours — in the pines, in bunkers, in ill-conceived love grass someone thought was a good idea — but he never got lost. “Watson pars,” as he fondly remembers them, could be as creative as a brainstorming room of very smart people, and they sustained him until he sank a long birdie putt, or more than one. He was as unafraid of a significant comebacker as Arnold Palmer had been from the late-1950s until the mid-1960s. But like Palmer, Watson’s window of putting invincibility wasn’t extended. By the late-1980s, trouble on the short ones — the 1987 U.S. Open at the Olympic Club, when he lost to Scott Simpson, springs to mind — seemed make the odds long of his sticking around like Nicklaus, for whom age was never a saboteur on the greens. Watson is an outlier for what came next, because instead of letting shaky putting drive him out of competition, as it does for so many, he persevered to win again. Sure, his last major victory did come when he was 33, but after a nine-year drought on the PGA Tour he won the 1996 Memorial when he was 46 and at Colonial two years later. Unlike one of his idols, Sam Snead, Watson didn’t go to an exotic putting method when things went south, he kept both hands in a conventional grip and kept on putting until they started to drop again. In a different kind of way, it was air as rare as when he was usurping Nicklaus with a putter touched by magic. Being more dogged than victim is hard work. Along the way, in 1994, Watson had a revelation about how to swing the club. He began keeping his shoulders on the same plane on backswing and downswing and not finishing in the reverse-C position as prevalent in the 1970s as loud pants and hard collars. It simplified his ball-striking that had always been nurtured by heavy practice and has allowed him to do the things he has done in recent years like winning the 2011 Senior PGA Championship at the record age of 61 or threatening to win that event again this year when he closed with a 65 at age 64. Of course, what will always be the atomic asterisk on Watson’s record, what will distinguish him from golfers who have won more, is how he had walked the 2009 British Open so far down the aisle it was crazy. At 59, 11 years older than the oldest major winner. Twenty-six years after his eighth and final major triumph. With an artificial left hip. Without appearing that it was any big deal when it was sport’s — not just golf’s — arguably all-time almost. He was on the 18th hole on a Sunday afternoon at Turnberry, where he’d won remarkably 32 years earlier, an 8-iron and two putts away from achieving something of a size never seen, an extra dimension beyond a record sixth British Open. Then there was a puff of wind or a piece of extra-firm turf where the ball landed, perhaps both, and presently Watson had an eight-footer for a winning par that made him, for a painful instant as the ball rolled weakly toward a playoff and second place, seem every bit his advanced golf age. Men, some of them roughly a third Watson’s age, will have eight-footers during the Ryder Cup at Gleneagles that mean a lot, if not the weight of his singular putt at Turnberry. Whatever he says or whatever you think, there will be occasions when Watson wishes he had a putter in his hands, alone in a crowd to win or lose, to see what he is made of one more deliciously difficult time. That’s whose birthday it is. Writing about my Johnny Palmer driver last week caused me to search to see if I could obtain a golf ball bearing his name as well. I found one for a reasonable price, and it has joined my modest golf-ball collection. 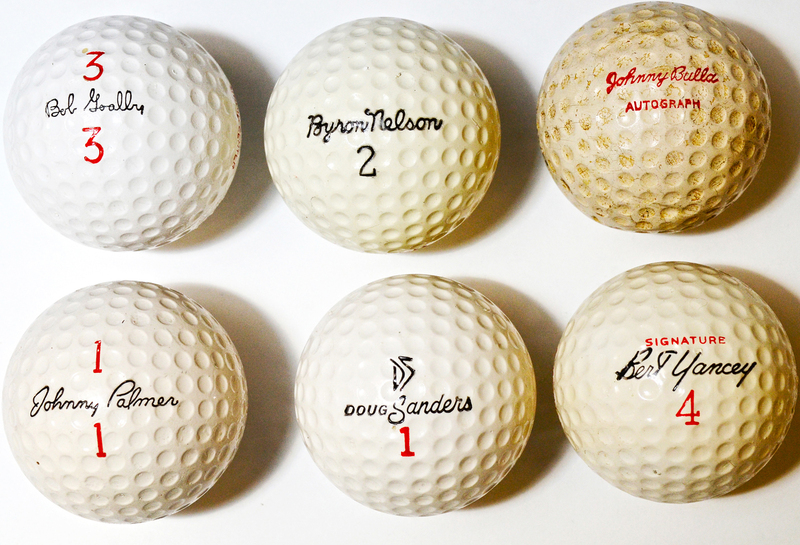 Here is the Palmer ball (bottom row, on the left) with five other signature balls that I already had. These days, when you think of a signed ball, it’s usually the Sharpie-autographed ones most pros give after their rounds to their walking scorers and standard bearers. (Many pros won’t sign a ball in the course of regular autograph duty.) 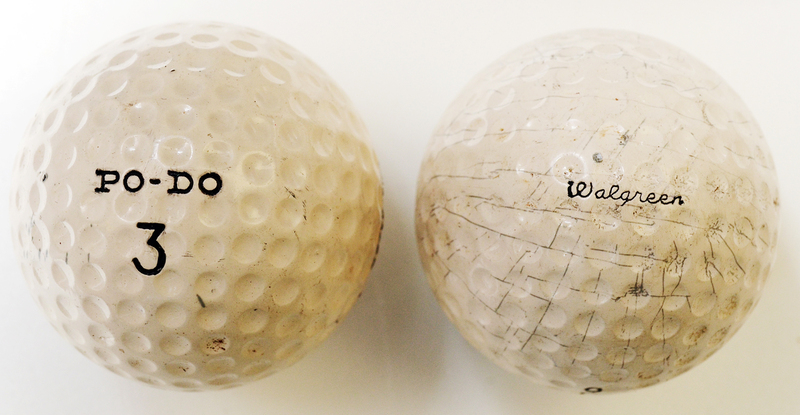 But manufactured signature golf balls used to be a staple in the game. As this small sample indicates, there were models for superstars (Byron Nelson), established winners (Doug Sanders) and lesser lights. Johnny Bulla (his model is far right on the top row) was a wonderful man, like Johnny Palmer (and me) a native North Carolinian. Winner of the 1941 Los Angeles Open, Bulla flew planes, was best buddies with Sam Snead and became a heck of a golfer playing left-handed, too. I had several great visits and phone calls with Bulla in his later years. He is one of the subjects in Al Barkow’s terrific oral history, Gettin’ to the Dance Floor. When it came to golf balls, Bulla was known for being the first player to endorse a model not sold in a pro shop. Bulla promoted the “Po-Do,” an inexpensive ball sold by Walgreens, and caught some flak for doing so. The Po-Do (below) was “vulcanized” for durability. That’s not a word you hear in current golf-ball marketing. My first driver, a Christmas present in 1969. This summer, shortly after losing a job that I’d had for more than 20 years, I moved a couple of miles away. Hassles aside, the move provided a change in scenery and a change in rent, both of which were useful. As it has about a dozen times over the decades, whether hundreds of miles along the eastern seaboard or one zip-code numeral away, my Johnny Palmer signature driver made the trip with me. The No. 1 wood is not the most valuable nor most sentimental of my possessions, but it has endured among my things. Since it came out of my golf bag so long ago, it has inhabited sheds, garages, neglected closets, the corner of a spare room with a Jack Kramer tennis racquet. Occasionally in my adulthood, the driver has been within reach of my large hands so they could overlap its worn, original grip that my small hands once eagerly embraced when the rubber was fresh and tacky. Every couple of years I hit a few balls with it, recalling who I was and what golf was when the Johnny Palmer and its brothers in the Spalding starter set became mine at Christmas in 1969. I was 10, a curious, sports-mad kid with a crew cut. For months I had looked at the page in the sporting-goods section of the Sears Wish Book where the clubs — and red-and-black bag — were listed. After a few seasons using only a Kroydon mallet-head putter and Wilson Sam Snead Blue Ridge 5-iron bought at Sky City, I wanted those seven matching clubs the way a debutante wants pearls. But regardless of the dog-eared page and my relentless reminders from Halloween forward, $49.95, as I recall the price, was a lot for the Fields family (and Santa Claus). Come Christmas morning, though, the Spaldings were under the tree. I received some smaller gifts, too, but needed nothing but my new set. That December 25th, even all the candy, fruit and nuts Santa brought and that made the day all the more special, wasn’t as coveted. In my young mind, those clubs made me a golfer. The driver held special status because I’d never hit one — only a neighbor’s stray 4-wood in a field near our house. Although the clubhead is about a third the size of drivers manufactured these days, it seemed huge when I slipped off the head cover for the first time. Teeing up a ball from a seventy-five cent small bucket at the local range was to sense the possibility of power. Momentarily, at least. Topping a shot was sad, an opportunity squandered. Skying a drive was like hitting a pop-up to the pitcher without the futile sprint down the first-base line. Slices floated frustratingly out of the imaginary fairway, my first physics lesson. Amid the poor shots, however, would come something resembling a good one. The club would move as if I almost knew what I was doing. The ball would carry toward my new favorite sport’s center field. The anticipation of trying to do it again would begin before the ball’s successful journey ended beyond the 150-yard sign. I had putted enough on the living room carpet and in our backyard and watched enough golf on television to know what golf’s end game was, but the lure of the (sort of) long ball, now that I had the Johnny Palmer driver, was a new dimension of golf fun. No one forgets their first far and sure shots, even if they were struck with a budget model, as mine were. 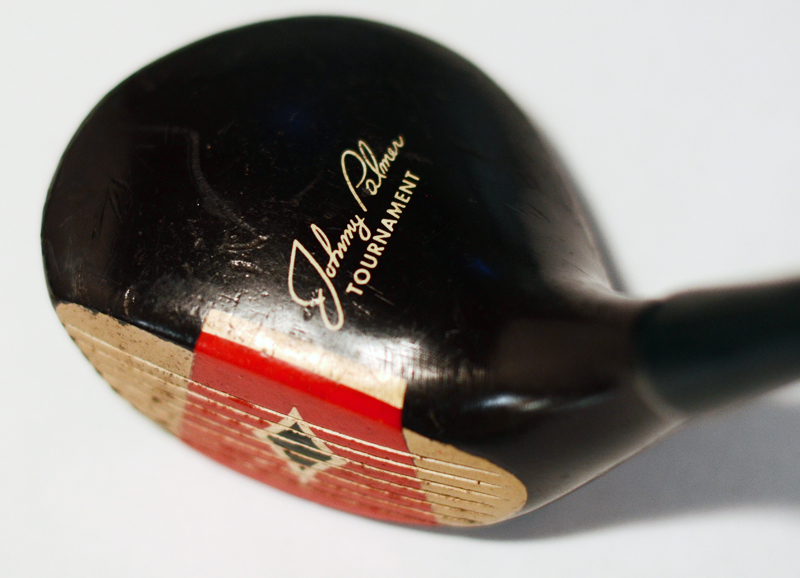 The club with Johnny Palmer’s autograph etched in white paint across its dark crown wasn’t even made of wood. It was formed of thermoplastic resin. In a nod to the real thing, Spalding called it “Persimmonite.” I couldn’t hit one “on the screws” because their were no screws on my first driver, only red paint with a black diamond in the middle. I knew who Arnold Palmer was when I was 10, but it would be a while before I found out about the golfer whose name was on my clubs. Johnny Palmer, as I discovered, was a tour winner — seven titles between 1946 and 1954, including two biggies, the Western Open and Colonial National Invitation — before Arnold Palmer won the U.S. Amateur. When Arnold joined Johnny Palmer in the field at the Masters, he was “A. Palmer” on the leader boards to distinguish him from the more established Palmer. Runner-up to Sam Snead in the 1949 PGA Championship, before his success on tour Johnny served in the Air Force during World War II, flying more than 30 missions over Japan as a B-29 gunner. Johnny Palmer was a North Carolinian, same as me, born in tiny Eldorado in Montgomery County, where my maternal grandfather was also born. Before Palmer died, at age 88 in 2006, I got a chance to meet him at the Legends of Golf one spring. He was in his 80s, a little frail, but he smiled when I told him I had gotten started in the game with clubs bearing his name. His driver — my driver — has a few nicks on top. I remember making one clumsy step walking off a tee when one of my metal spikes gouged the faux persimmon. There are tee marks on the sole, some white paint on the rear, a tiny bit of dirt in the grooves. It is an old club that speaks of a new time when life, like a striped golf ball, was waiting to lift off, to see how far it could go. A number of visions of Bernhard Langer stand out after his more than four decades as a professional golfer: hitting a ball from—not around or over or under—a tree at the 1981 Benson and Hedges International; winning the 1985 Masters, resembling, in his all-red ensemble, someone who had time much time and too much Rit within reach on the eve of the final round; losing the 1991 Ryder Cup with a missed putt and resulting grimace that seemed appropriate for an actual war, not a faux one on a resort golf course; the cool, calm and collected man out-captaining American Hal Sutton in the 2004 Ryder Cup at Oakland Hills during yet another European victory. Those images aren’t going anywhere, but they now must be augmented with something from Langer on the tawny turf of Royal Porthcawl in Wales over the weekend. At the Senior British Open—one of three, in my mind, true majors in senior golf—Langer played one of the best tournaments by anyone on any tour. Ever. Langer finished at 18-under 266, 13 strokes ahead of Colin Montgomerie, in a performance that had echoes of Bob Beamon, Secretariat and Tiger Woods winning the 2000 U.S. Open by 15 shots. Montgomerie had to sweat out a playoff victory over Gene Sauers in the U.S. Senior Open, but the other 2014 men’s Opens were clear-cut decisions: Martin Kaymer by eight at Pinehurst No. 2 and Rory McIlroy wire-to-wire at Royal Liverpool. In a summer of big statements, Langer was Reggie Jackson hitting a home run out of Tiger Stadium at the 1971 All-Star Game. Woods’ majestic 2000 U.S. Open and Louise Suggs’ 14-shot victory at the 1949 U.S. Women’s Open are the only majors won by larger margins. And a ginger beer to Old Tom Morris, who won the 1862 British Open by 13 strokes over just 36 holes. In senior golf, though, Langer now stands at the top of Mount Blowout, eclipsing Hale Irwin’s 12-stroke win at the 1997 Senior PGA Championship, one of Irwin’s 16 victories in a two-year span. Irwin still has more than twice as many Champions Tour career victories as Langer—45 to 22—but with his fourth win of the season Langer has climbed to T-6 on the all-time list with Don January and Chi Chi Rodriguez. Irwin’s total appears safe, but the 56-year-old Langer could possibly threaten the No. 2 senior, Lee Trevino, who won 29 times. A relevant endorsement of Langer’s Champions Tour career is that he now has far more wins (including four senior majors, to go with his two Masters titles) than anyone in his immediate age group. Of golfers born after 1950, Jay Haas, 60, is a distant second with 16 career victories. Skeptics of senior golf, and there are many, might not acknowledge the high quality of the golf even in the wake of such a dominating effort as Langer’s. They will use the picture at the finish line as evidence of a shallow talent pool and an argument against the Champions Tour as full-fledged competition. Langer’s overwhelming victory, however, can just as easily be viewed a different way. Montgomerie was coming off wins in the Senior PGA and U.S. Senior Open and playing some of the best golf of his life—he wasn’t easing up for his old European Tour mate and longtime Ryder Cup teammate—and it was no contest. Langer, who was T-8 at the 2014 Masters, dresses like someone half his age and has the physique to do so. He is so fit for a fiftysometing that when he uses that anchored long putter, it seems almost as out of place tucked up against his chest as Adam Scott’s does on him. Not long after the anchoring ban was announced, I was at a Champions Tour event and saw Langer practicing Matt Kuchar-style, club up his left forearm. I asked him not long ago if he had been continuing to work on methods that will be legal come January 2016 and he said, in essence, he is going to anchor his putter as long as he can and deal with what happens next when he must. That makes sense: Langer loves to compete, and anchoring the putter is helping him compete. Regardless of what purists think of the style, while it remains legal why dilute your golf being before you have to? The way Harry Vardon and Sam Snead each found a way to play on after getting the yips, so has Langer in his time. The broomstick might not be fashionable, but it is most functional. Putting isn’t close to the whole story for Langer’s second-act virtuosity, however. The only statistical category in which he is remotely approaches average this year is sand saves, where he is ranked 58th. There was chatter after Langer won so convincingly at Royal Porthcawl that captain Paul McGinley should consider him for the European Ryder Cup team at Gleneagles. Similar talk occurred after Montgomerie completed his senior-major double a couple of weeks ago in Oklahoma. I don’t see McGinley going the Langer route—perhaps unless he goes undefeated between now and when he makes his picks—but the fact that there is even a starter conversation a full decade since Langer himself was captain is a testament to the German native’s golf in 2014. Some feel like once someone has a bronze in the Hall of Fame, his career is in epilogue gear thereafter. I haven’t ever subscribed to that theory but particularly since 2001, when I saw how disappointed Jack Nicklaus was after he let the U.S. Senior Open slip away late in the final round when he was 61. In the rare sport where longevity much more legitimate than hit-and-giggle is even possible, it makes little sense to discount post-prime but still wonderful play. Whatever a golfer’s age, there is pleasure in watching him create a great distance between himself and his pursuers, as if he were in a cigarette boat and the rest were in Sunfishes, because it doesn’t happen often. Langer sure isn’t a fast golfer, but it was as if he was in a very fast craft at Royal Porthcawl. Langer isn’t much of a drinker—I’ve heard him say he enjoys an occasional shandy. I sure hope he had a couple last night.